Wings of Glory Aerodrome - Fokker DVII Repaint. With thanks to Gunners and Dom for supplying the decals. Here is the plane after a night in the freezer and rapid emersion in almost boiling water to shock the glued joints apart. 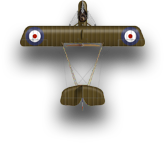 Note that I have also removed the decal camo to reveal the original colour underneath. This was achieved by the use of Micro sol and a cocktail stick. The next stage was to spray undercoat the plane white. Then the details were added, and given a black wash. I then cut out the decals to a template I had made by drawing around the wings. Micro set was applied to the under wings and the decals were afixed. The plane was left to dry overnight. It was then re-assembled with superglue. It was now ready for the rest of the decals to be positioned. Micro set was applied again, and once the decals were firmly in place, Micro sol was lightly brushed over to aid the conformity to the body. by one of Testor's Dull coat to take off the shine.